Home Security 101 – What does a Carbon Monoxide Detector do? Often called “the silent killer,” carbon monoxide (CO) is a silent, invisible byproduct of incomplete combustion, so it’s often associated with furnaces and portable heaters. At only medium concentration, CO can cause death in as little as 15 minutes, while much lower levels can harm pregnancies and cause long-term health issues. Death caused by CO inhalation is on the increase. In fact, the AMA (American Medical Association) names CO as the leading cause of accidental poisoning deaths in America. While the cheaper “plug in” sensors are readily available, there is no substitute for a wireless monitored carbon monoxide detector.Just like a monitored smoke and heat sensor, a monitored CO sensor will send the alarm to the 24 hour monitoring center, which can dispatch help immediately. If you have passed out from CO poisoning, just having a loud noise is not going to save your life. A monitored system has a much better chance of making that crucial difference – by summoning help. 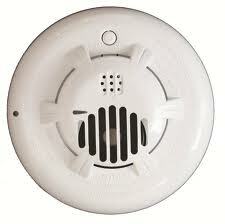 The Burns & McBride carbon monoxide alarm is built on an electrochemical detector with a five year sensor life. With these features, it can detect increased levels of carbon monoxide early. And unlike standard, store-bought alarms, it is supported by the Burns & McBride Go!Control panel and central monitoring station, giving you 24×7 assistance and support. For more information on carbon monoxide detectors or other add-ons to the Burns & McBride Smart, Safe Home system call us at 302-656-5110 or visit our website at http://www.burnsandmcbride.com.